For the past decade, my husband’s excuse for not going through his old LPs was that he’d do it when we move. We’re moving on Saturday. The replacement excuse is that he doesn’t have time because he has too much packing to do. 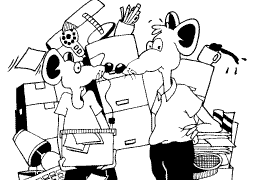 One could make the point that there’d be less packing to do if he’d toss some of his stuff. Bracing for high seas, one does. “So you’re calling this junk?” Ed is holding aloft a Tony Bennett album. Ed says that many of his LP’s are irreplaceable. I recognize this argument. I believe I used it in explaining why I did not throw away, among other priceless items, a Pan Am airsickness bag, some rocks from the Arctic Circle with pretty orange lichen on them, and a 1987 USDA press release entitled, “Milestones in Dairy History.” But in those instances, it was my argument, and so it made excellent sense. I recently read an article about hoarding in the animal kingdom. The male black wheatear bird, the article said, collects piles of heavy stones before mating season. “Those with the largest piles are more likely to mate,” the story explained and at the same time didn’t really explain. If I should die suddenly – which seems more and more likely as the week wears on – Ed should consider expanding his dating pool to include female wheatear birds. I’ll make a note of it in my will. Ed tries to explain why he would want to keep a pile of records he never listens to. “It’s just knowing that they’re there. That I could listen to them if I wanted to.” I remind him that his turntable doesn’t work. “So, actually you can’t listen to them.” Which reminds me. I pick up the turntable and put it on the designated throwaway pile, which I had envisioned at the beginning of this undertaking as a towering, teetering mound engulfing most of our front entryway and portions of the sidewalk, but is in reality closer in size to the little mounds of toenail parings Ed occasionally stacks up on the bedside table. These are, happily, replaceable, and I encounter only token resistance when I throw them away. “You can’t throw the turntable out. It belongs to Andrea.” Andrea is his ex-wife. In the end, we compromised. He kept some, and he sold some. He forgave me for the anguish I’d caused him, because he was able to get $240 for his LPs at the new and used music store. This he used to buy 31 used CDs, which take up not quite but almost the same square footage as the LP’s, and will impress the heck out of the next female wheatear who comes to town.